Apple unveiled its newest batch of MacBook Pros today at WWDC, the ones sporting the new Retina displays. And yes, in terms of performance, next-generation MBPs beat the competition like a pack of rented mules. It feels an odd comparison when even last season's MBP can't hold a flame to the current version. 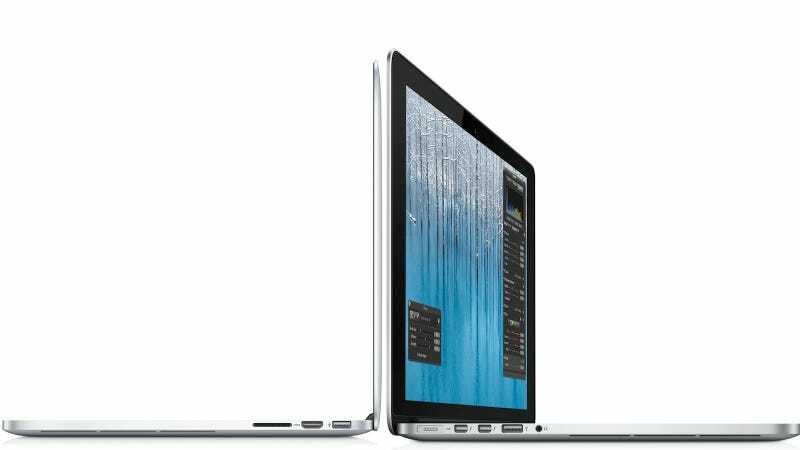 The 2011 MacBook Pro was nothing to sneeze at—1680x1050 resolution with 128 pixels per square inch (ppi) powered by an AMD Radeon HD 6490M. Pffff, the MacBook Pro unveiled today rocks a 2880 x 1800 display at 220 ppi, roughly double the going rate of current Apple hardware and even more obvious when compared to non-Apple gear. As the table above illustrates, the new MBP screen displays at nearly double the pixel density as it's nearest competitors. Even the $1,700 Alienware M15—the MBP's closest rival in terms of graphics quality—pales in comparison to the new laptop's hyper-HD display.